NEW YORK - April 29, 2013 - PRLog -- NEW YORK, NY — On Tuesday May 7 from 8 pm until 10 pm, Liberated People (http://liberatedpeople.tumblr.com/) will produce an invite-only benefit event at Miss Lilly’s on 132 West Houston Street, New York, NY. The inaugural event for Liberated People, a lifestyle brand that creates sustainable eco-friendly t-shirts and accessories to commemorate freedom fighters who have inspired democracy and independence in nations around the globe, will bring together 130 professionals in various industry segments, from finance to health and beauty and non-profit. The launch event will be hosted by Liberated People founder, New York Times writer and actor and Gbenga Akinnagbe (The Savages, The Taking of Pelham 123, Damages, Lottery Ticket, The Wire) and Liberated People brand ambassador, three-time Emmy nominated media professional, Ojinika Obiekwe (http://www.ojinika.com/). 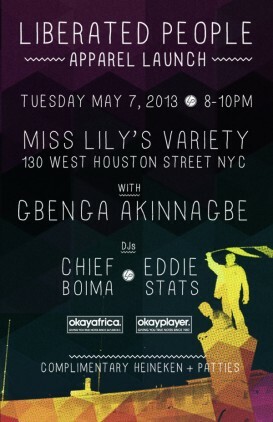 The event will also feature Liberated People’s latest t-shirt collection, cocktails and hors d’oeuvres, Liberated People branded swag bags, and music by two popular NYC deejays, DJs Boima (http://www.thefader.com/2011/06/23/ghetto-palms-chief-boi...) and Eddie Stats (http://chiefboima.com/). A portion of the profits from t-shirt sales at the event will be donated to a local non-profit organization, Beat The Streets (http://www.beat-the-streets.org/), to help them achieve their goals of improving the quality of life of their youth members. As part of the Liberated People’ s mission of creating more awareness to inspire others to help each other and to help local non-profits succeed, Liberated People will launch a social media campaign called “#LBR8 (https://twitter.com/weareliberated)” at the event. Individuals are encouraged to share their #LBR8 story of how they are making changes in the world through audio, video or in writing via social media platforms, including Pinterest, Instagram, Facebook, Twitter, Linkedin, and YouTube. Additionally, individuals who have been who have been touched by Liberated People either through the messages on the t-shirts and/or its work with local non-profits like Beat the Streets, can leverage the “#LBR8 (https://twitter.com/weareliberated)” to engage the world about how platforms like Liberated People can become a movement to impact lives. At the event, guests will get a chance to view and purchase the Liberated People Spring 2013 collection which features designs for both men and women in four color schemes: black, white, shades of blues, and greens. The super-soft, pre-washed, tagless, crew neck shirts are inspired by humanity's common struggle of overcoming oppression, and feature dates of liberation paired with designs of the nation's flag and/or inspirational imagery. The event is made possible by the generosity and support of sponsors around globe, including Amariya’s Kitchen, Essence Magazine, DJ Boima, DJ Eddie Stats, Flu Watch, Fan M Kanson Network, Heineken, Mike Cooke Photography, Miss Lilly’s, Mocada, NibMor, Ojinika Obiekwe , OkayPlayer, RJB Agency, To the Top Productions, Tyson Beckford, and Wild Spirit. About Liberated People: Launched by critically acclaimed actor Gbenga Akinnagbe, Liberated People is an intuitive eco-friendly lifestyle brand that develops innovative and transformative products for people around the world. Its bestselling product is a t-shirt collection with messages that empower people around the world to engineer changes in their lives and in the lives of others.